So, here I am again to share another recipe with you. This time, it's a main course dish with fish. I am a huge fan of fish especially now that it became so difficult to get. Coming from a country that's located by the Ocean, fish is one of things we eat the most. any kind of fish made in any way. Over here in the Netherlands, it's a bit difficult to meet this past experience... But, I found some nice cod fish fillets at the supermarket and decided to give t a try. Dip the cod fish fillets on the scrambled eggs and then on the bread crumbs. Make sure that all surface is cover. 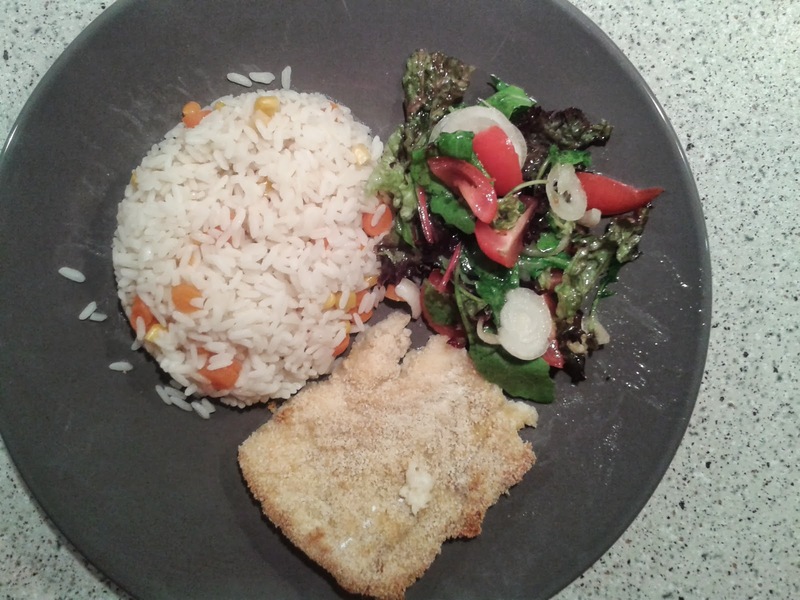 On the side, I prepared a rice with corn and carrots, and a nice salad (lettuce, onions and cherry tomatoes). This had a huge thumbs up from Mr.A so I hope you will also like it! what a beautiful dish! i´m not a big fan of fish probably because here we have a lot of them! i will never cook like that... thanks to gods i have a cook at home!! Uncle A it's also a very good cook!